References m_bgcolorSelector, m_checkHidden, m_checkOverline, m_checkStrikeOut, m_checkSubScript, m_checkSuperScript, m_checkTransparency, m_checkUnderline, m_colorSelector, m_currentBGColor, m_currentBGColorTransparent, m_currentFGColor, m_doneFirstFont, m_fontList, m_funkyColor, m_gc, m_iSubScriptId, m_iSuperScriptId, m_pFrame, m_preview, m_sizeList, and m_styleList. References XAP_Dialog_FontChooser::addOrReplaceVecProp(), m_bgcolorSelector, m_checkTransparency, m_currentBGColor, m_currentBGColorTransparent, UT_HashColor::setColor(), and updatePreview(). References abiAddButton(), abiDialogNew(), BUTTON_CANCEL, BUTTON_OK, constructWindowContents(), XAP_App::getStringSet(), XAP_StringSet::getValueUTF8(), XAP_Dialog::m_pApp, and s.
References createFontTabTreeView(), XAP_EncodingManager::fontsizes_mapping, gchar, XAP_App::getStringSet(), XAP_StringSet::getValue(), XAP_StringSet::getValueUTF8(), m_bgcolorSelector, m_checkHidden, m_checkOverline, m_checkStrikeOut, m_checkSubScript, m_checkSuperScript, m_checkTransparency, m_checkUnderline, m_colorSelector, m_fontList, m_iSubScriptId, m_iSuperScriptId, XAP_Dialog::m_pApp, m_preview, m_sizeList, m_styleList, UT_Bijection::nth2(), PREVIEW_BOX_BORDER_WIDTH_PIXELS, PREVIEW_BOX_HEIGHT_PIXELS, s, s_bgcolor_update(), s_color_update(), s_drawing_area_draw(), s_hidden_toggled(), s_overline_toggled(), s_select_row_font(), s_select_row_size(), s_select_row_style(), s_strikeout_toggled(), s_subscript_toggled(), s_superscript_toggled(), s_transparency_toggled(), s_underline_toggled(), UT_Bijection::size(), text, and TEXT_COLUMN. References XAP_Dialog_FontChooser::addOrReplaceVecProp(), m_colorSelector, m_currentFGColor, UT_HashColor::setColor(), and updatePreview(). References XAP_Dialog_FontChooser::addOrReplaceVecProp(), gchar, m_fontList, text, TEXT_COLUMN, and updatePreview(). References XAP_Dialog_FontChooser::m_bChangedHidden, XAP_Dialog_FontChooser::m_bHidden, and m_checkHidden. 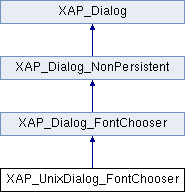 References XAP_Dialog_FontChooser::m_bBottomline, XAP_Dialog_FontChooser::m_bChangedOverline, XAP_Dialog_FontChooser::m_bOverline, XAP_Dialog_FontChooser::m_bStrikeout, XAP_Dialog_FontChooser::m_bTopline, XAP_Dialog_FontChooser::m_bUnderline, m_checkOverline, XAP_Dialog_FontChooser::setFontDecoration(), and updatePreview(). References XAP_Dialog_FontChooser::_createFontPreviewFromGC(), abiRunModalDialog(), BUTTON_CANCEL, BUTTON_OK, constructWindow(), XAP_EncodingManager::fontsizes_mapping, GR_CairoGraphics::getAllFontNames(), XAP_App::getApp(), XAP_Dialog::getApp(), XAP_App::getGraphicsFactory(), XAP_Dialog_FontChooser::getVal(), LIST_STYLE_NONE, XAP_Dialog_FontChooser::m_answer, XAP_Dialog_FontChooser::m_bChangedColor, XAP_Dialog_FontChooser::m_bChangedFontFamily, XAP_Dialog_FontChooser::m_bChangedFontSize, XAP_Dialog_FontChooser::m_bChangedFontStyle, XAP_Dialog_FontChooser::m_bChangedFontWeight, XAP_Dialog_FontChooser::m_bChangedHidden, XAP_Dialog_FontChooser::m_bChangedOverline, XAP_Dialog_FontChooser::m_bChangedStrikeOut, XAP_Dialog_FontChooser::m_bChangedSubScript, XAP_Dialog_FontChooser::m_bChangedSuperScript, XAP_Dialog_FontChooser::m_bChangedUnderline, m_bgcolorSelector, XAP_Dialog_FontChooser::m_bHidden, m_blockUpdate, XAP_Dialog_FontChooser::m_bOverline, XAP_Dialog_FontChooser::m_bStrikeout, XAP_Dialog_FontChooser::m_bSubScript, XAP_Dialog_FontChooser::m_bSuperScript, XAP_Dialog_FontChooser::m_bUnderline, m_checkHidden, m_checkOverline, m_checkStrikeOut, m_checkSubScript, m_checkSuperScript, m_checkTransparency, m_checkUnderline, m_colorSelector, m_currentBGColor, m_currentFGColor, m_doneFirstFont, m_fontList, m_funkyColor, m_gc, m_pFrame, m_preview, m_sizeList, m_styleList, XAP_App::newGraphics(), searchTreeView(), std_size_string(), TEXT_COLUMN, updatePreview(), UT_ASSERT_HARMLESS, UT_convertToPoints(), UT_DEBUGMSG, UT_parseColor(), and UT_SHOULD_NOT_HAPPEN. References XAP_Dialog_FontChooser::addOrReplaceVecProp(), XAP_EncodingManager::fontsizes_mapping, gchar, m_sizeList, text, TEXT_COLUMN, updatePreview(), and UT_ASSERT. References XAP_Dialog_FontChooser::m_bBottomline, XAP_Dialog_FontChooser::m_bChangedStrikeOut, XAP_Dialog_FontChooser::m_bOverline, XAP_Dialog_FontChooser::m_bStrikeout, XAP_Dialog_FontChooser::m_bTopline, XAP_Dialog_FontChooser::m_bUnderline, m_checkStrikeOut, XAP_Dialog_FontChooser::setFontDecoration(), and updatePreview(). References XAP_Dialog_FontChooser::addOrReplaceVecProp(), LIST_STYLE_BOLD, LIST_STYLE_BOLD_ITALIC, LIST_STYLE_ITALIC, LIST_STYLE_NORMAL, m_styleList, updatePreview(), and UT_ASSERT_HARMLESS. References XAP_Dialog_FontChooser::m_bChangedSubScript, XAP_Dialog_FontChooser::m_bChangedSuperScript, XAP_Dialog_FontChooser::m_bSubScript, m_checkSubScript, m_checkSuperScript, m_iSuperScriptId, XAP_Dialog_FontChooser::setSubScript(), XAP_Dialog_FontChooser::setSuperScript(), and updatePreview(). References XAP_Dialog_FontChooser::m_bChangedSubScript, XAP_Dialog_FontChooser::m_bChangedSuperScript, XAP_Dialog_FontChooser::m_bSuperScript, m_checkSubScript, m_checkSuperScript, m_iSubScriptId, XAP_Dialog_FontChooser::setSubScript(), XAP_Dialog_FontChooser::setSuperScript(), and updatePreview(). References XAP_Dialog_FontChooser::addOrReplaceVecProp(), m_checkTransparency, m_currentBGColorTransparent, and updatePreview(). References XAP_Dialog_FontChooser::m_bBottomline, XAP_Dialog_FontChooser::m_bChangedUnderline, XAP_Dialog_FontChooser::m_bOverline, XAP_Dialog_FontChooser::m_bStrikeout, XAP_Dialog_FontChooser::m_bTopline, XAP_Dialog_FontChooser::m_bUnderline, m_checkUnderline, XAP_Dialog_FontChooser::setFontDecoration(), and updatePreview(). References XAP_Dialog_FontChooser::event_previewClear(), XAP_Dialog_FontChooser::event_previewExposed(), XAP_Dialog_FontChooser::getDrawString(), m_doneFirstFont, and m_gc. Referenced by bgColorChanged(), fgColorChanged(), fontRowChanged(), overlineChanged(), runModal(), s_drawing_area_draw(), sizeRowChanged(), strikeoutChanged(), styleRowChanged(), subscriptChanged(), superscriptChanged(), textTransformChanged(), transparencyChanged(), and underlineChanged(). Referenced by bgColorChanged(), constructWindowContents(), runModal(), and XAP_UnixDialog_FontChooser(). Referenced by constructWindowContents(), hiddenChanged(), runModal(), and XAP_UnixDialog_FontChooser(). Referenced by constructWindowContents(), overlineChanged(), runModal(), and XAP_UnixDialog_FontChooser(). Referenced by constructWindowContents(), runModal(), strikeoutChanged(), and XAP_UnixDialog_FontChooser(). Referenced by constructWindowContents(), runModal(), subscriptChanged(), superscriptChanged(), and XAP_UnixDialog_FontChooser(). Referenced by bgColorChanged(), constructWindowContents(), runModal(), transparencyChanged(), and XAP_UnixDialog_FontChooser(). Referenced by constructWindowContents(), runModal(), underlineChanged(), and XAP_UnixDialog_FontChooser(). Referenced by constructWindowContents(), fgColorChanged(), runModal(), and XAP_UnixDialog_FontChooser(). Referenced by bgColorChanged(), runModal(), and XAP_UnixDialog_FontChooser(). Referenced by bgColorChanged(), transparencyChanged(), and XAP_UnixDialog_FontChooser(). Referenced by fgColorChanged(), runModal(), and XAP_UnixDialog_FontChooser(). Referenced by runModal(), updatePreview(), and XAP_UnixDialog_FontChooser(). Referenced by constructWindowContents(), fontRowChanged(), runModal(), textTransformChanged(), and XAP_UnixDialog_FontChooser(). Referenced by runModal(), and XAP_UnixDialog_FontChooser(). Referenced by runModal(), updatePreview(), XAP_UnixDialog_FontChooser(), and ~XAP_UnixDialog_FontChooser(). Referenced by constructWindowContents(), superscriptChanged(), and XAP_UnixDialog_FontChooser(). Referenced by constructWindowContents(), subscriptChanged(), and XAP_UnixDialog_FontChooser(). Referenced by constructWindowContents(), runModal(), and XAP_UnixDialog_FontChooser(). Referenced by constructWindowContents(), runModal(), sizeRowChanged(), and XAP_UnixDialog_FontChooser(). Referenced by constructWindowContents(), runModal(), styleRowChanged(), and XAP_UnixDialog_FontChooser().